The arbitration decision is the latest in a legal fight between former Harmonix owners Viacom and the game developers. Last year a group of former Harmonix shareholders - including company CEO Alex Rigopulos and his co-founder Eran Egozy - sued Viacom over claims of unpaid bonuses. 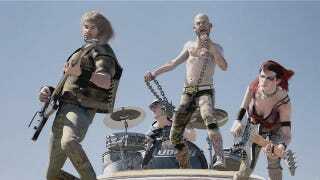 The bonuses were based on Rock Band sales goals that the game hit. In 2007, most of those payments were made, but the 2008 payments never were, according to the original suit. On Dec. 19, arbitration accountants said that the Harmonix shareholders are entitled to receive an additional $383 million as part of that original 2006 acquisition, according to a Dec. 27 filing with the Securities and Exchange Commission. Earlier this week, Viacom filed a suit in the Delaware Court of Chancery seeking to "compel the resolution accountants to consider arguments and evidence that were improperly excluded and to vacate the determination of the resolution accountants on the grounds of manifest error." So Viacom is fighting the decision.